The provisional results, and points table for each category is available to download. Full log after 5 events (pdf version). Certain categories are missing from event #1 (this will be corrected and updated before the final event). Some names are missing from the results, possibly due to illegible hand writing when entering on the day. 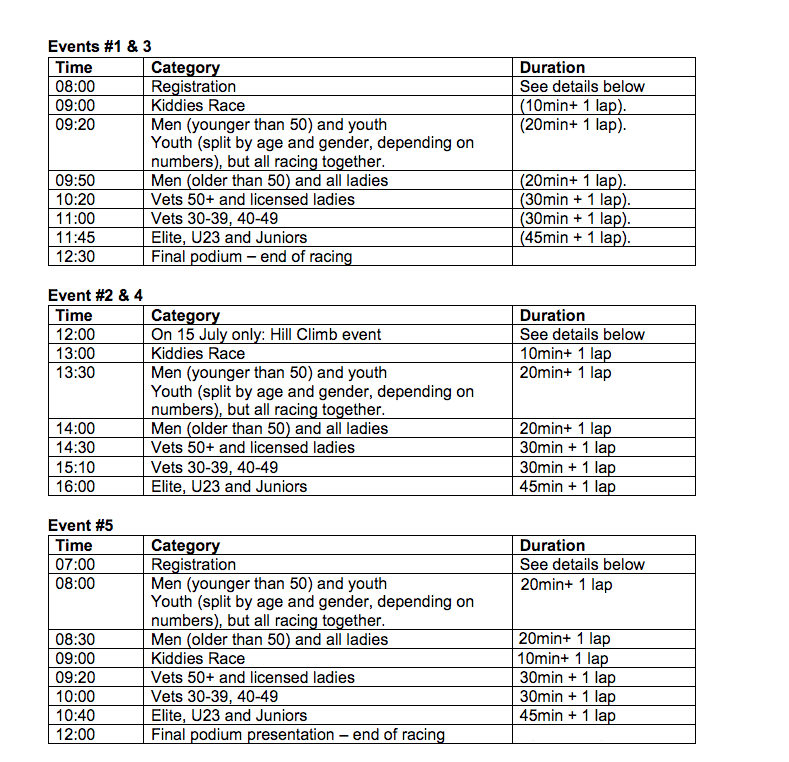 Points for each event, awarded to top 10 in each age group and category. Licences – all riders in all events need to hold a valid CSA license/CSA Membership. Day license can be purchased on the day. All riders must sign on at the registration desk on arrival and collect their race number. Any rider withdrawing from a race must remove their race numbers and hand them to a commissaire at the finish line as soon as possible. It is important that you advise finish line officials if you do withdraw. Please arrive at the start time published above, so that we can advise on the number of categories and revise the start times, if necessary. Sufficient parking at all events. In the case of a recognised mishap as defined in the provisions governing track races, the rider shall be entitled to a neutralisation of one or two laps to be determined by the commissaires according to the length of the circuit. After the neutralisation, the rider shall resume the race but shall not earn any points in the following sprint. Hold your line, and ride in a responsible manner (especially on the turns). Don’t overlap your front wheel to another rider’s rear wheel. Racing may be serious, but we are all here to have fun – don’t forget to treat your fellow participants with respect, whether you’re in the right or wrong. No time trial bikes, or aero bars allowed. Participants will be requested to complete the entry form, and sign the indemnity form before being allowed to enter. Appropriate gear restrictions apply for juveniles and juniors. Race official’s decision is final, and no correspondence will be entertained. Points will accumulate per event, and then divided by the number of events in the series to give a final points table. Prizes will be awarded for the best in each category.